Why is it sometimes cheaper to fly within the UK than taking the train? We are planning to travel to Scotland from Manchester and after looking at the prices for both flights and trains. It's cheaper to fly there than taking a train. I've also noticed the same thing when comparing flights and train prices from London to Manchester. Why are train tickets so expensive? For example, on the 6th of February, 2019 a return ticket from Manchester to Aberdeen for 23-24 March costs £133.30. Any off-peak train. Return within 1 month. Flights between Manchester and Aberdeen today for that weekend vary between £30-£66. Flying is also faster including check-in times. 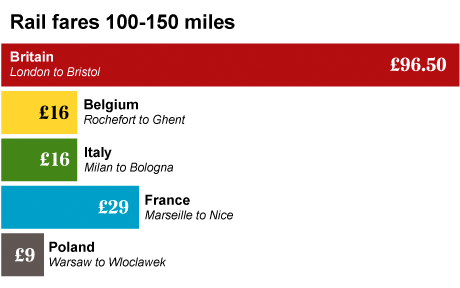 One of the big differences between UK and EU rail pricing, is that the UK uses the supply and demand and Willingness To Pay (WTP) pricing model similar to that used by airlines, while many EU train services use a much simpler €/km pricing model. This way, in the UK you get odd things like a short rail journey costing (say) £9.40 single and just £9.60 return; and you get outlandishly high fares for last minute travel on the next train, but reasonably good discounts if you plan your journey weeks in advance and pay for a specific off-peak departure (bit like an airline in that respect). While it does include a lot of cherry-picking, and doesn't really address why train fares are so expensive (which is still up to debate both by politicians and the general public), it does show that high rail prices are something that you can expect in the UK. Also prices are usually increasing each year as well usually with higher rates than inflation. Air travel in comparison, especially on low cost airlines is still cheap, it's much more common that low and ultra-low-cost airlines like RyanAir or WizzAir will try to charge you on the extras instead of the plain ticket prices. Also don't forget that although the rail system in the UK is privatised there's not really many competition between the rail companies, as each of them only serves part of the country - there's only a handful routes where you actually have the option to pick between multiple train companies - meaning there's also less of a competition between them to decrease prices. Flight companies however do operate on the same route - meaning there's more competition between them that can affect their prices. However there are some ways you might be able to get cheaper rail fares. Railway in the UK is privatised and there are multiple train companies operating in the country on a franchise basis. Some companies are only providing train travel on a small part of the country, but some others like Virgin, LNER or CrossCountry operate long-distance trains as well. When checking routes if you are lucky enough that your trip is served by only one company, then you might be lucky, as they usually have advance tickets for sale. However if the route is served by multiple companies (as you have to switch trains at some point) the price will be dependent whether both of the sections have a cheaper advance ticket, or not. For example a trip from London to Aberdeen would only include travel on LNER trains - meaning LNER alone could give you a bargain price on an advance off-peak single ticket. However a trip from Manchester to Aberdeen includes multiple companies - likely the Transpennine Express from Manchester to Glasgow, then either CrossCountry or ScotRail to Aberdeen. It's possible in this case that only the section from Manchester to Glasgow is on sale, or only the section from Glasgow to Aberdeen is on sale. It's also possible that there's a cheaper ticket if you wait a few hours in Glasgow - but these options will not show up on a normal booking page, only the more expensive fare. However some sites like trainsplit.com does search differently, and will allow you to buy separate tickets for the separate legs potentially driving costs down even more. Also book off-peak or super-off-peak tickets, and book non-refundable tickets that are only valid to one specific train. Similarly to plane tickets the more flexible they are the more expensive they get. Also similarly to them the prices of advance rail tickets might also go both up and down, so it might not always be worth booking too far in advance. Advance tickets might not always be available - some train companies don't sell them for example at all, as they only have plain peak and off-peak tickets. This can be relevant on routes which are only served by changing trains and train companies. If there are advanced tickets, for both the outward and return journey then they can be cheaper than an anytime return ticket. Railcards will give you 1/3 off the price of off-peak tickets. For long distances if you travel with someone a two-together railcard might sometimes make the trip cheaper than the cost of the railcard itself (£30, and you can use the railcard for subsequent travels in the year as well). If you're travelling alone or in a group you might be able to find other railcards that can help you drive the cost down, especially if you're either a Senior, or younger than 30 years old. Airports are usually not centrally located, and the transfer from the airport to the city can easily add a lot to the cost of the ticket. Trains usually depart and arrive to the city centre. The transfer ticket from the airport to the city can easily get into the £10-£20 range in some locations, especially London. Usually only small cabin bags are included in the air fare (and in case of RyanAir they are now only allowing really-really small bags without paying extra). Any additional bags need to be bought separately - which can add to the total cost of your trip. Also no liquids in bottles measuring more than 100ml, unless you pay extra for putting your bags in the hold. On trains both the baggage allowance and what you can bring onboard is much more relaxed. The transfer, check-in, security and baggage reclaim can actually take a substantial time, which might easily eat away a lot of the time gained by the shorter fare time. I usually do the Edinburgh-London trip, and usually I have a choice between using an LNER train to London or by finding some cheap tickets from Edinburgh Airport to London Stansted. I can usually find train tickets in the £60-£120 price range each way, while air fares are usually between £20-£100. When I can find something in the £20-40 range I usually opt for that, but above it, the extra hassle with baggage (£10-£15), airport transfer (£10-£20) and security means I am usually better off with a £80-£100 train ticket. Time wise they are also comparable: although the plane flight only takes an hour, I also have to get to and from the airport which can take up to an hour in both Edinburgh and London, and there's still check-in, security, and baggage reclaim, which can easily add to a total of 4 hours, which is almost the same as the the 4.5 hours trip for the train - and on the train there's at least free wifi. And both of them are usually delayed as well. Your £133 train ticket isn't tied to a specific connection like your cheap plane ticket is. For some random dates in April I was offered a return for £52 (two singles at £25 and £27 each). These tickets are sold out for your dates, so you're only offered the more expensive semi-flexible tickets. Always keep in mind the varying conditions when comparing prices. It's not usually cheaper to fly. But since UK rail ticketing is ridiculously complicated, it is often difficult to find the cheapest option. In theory, there are 40 different advance fares in second class between Manchester Picadilly and Aberdeen, as you can see through brfares.com, varying in price from £20.50 to £89.50, with each of those advanced fares having its own specific conditions — but most of those will have few or none tickets available, perhaps only for the most unattractive times long in advance. There are three types of single and four types of returns, again with their own conditions. And then you can split your journey. One way to search for splits is via trainsplit.com, which for those dates finds a combination of 5 singles (2 Off-Peak Single and 3 Advance) totalling £100.40, saving £32.90 on the cheapest Off-Peak Return (trainsplit.com (no affiliation) takes a small share of the savings if you book through them). As a bonus, it turns out the cheapest option on the way back is actually in first class. You may be able to manually find even better combinations. I used to travel every fortnight between Reading and Lancaster, and usually I bought seven singles: one off-peak, five advance, and one special evening-only midlands fare. You may end up spending more time booking than travelling, but with the UK railway ticketing system it usually pays off to shop around and game the system, in particular for long journeys. Anybody who knows their way around, will never buy a single Reading to Birmingham: splitting in Banbury is always cheaper. Ridiculous? Certainly. Permitted? Yes. Downsides? More effort in booking, and in theory, you may be at a disadvantage if you miss connections, if you bought separate tickets. In practice, I've always been allowed on later connections, including Virgin Trains paying for a middle of the night taxi from Banbury to Reading when I missed the final train home, despite having a split of four tickets for my journey south. Only my bike reservation has been an issue a couple of times, requiring some extra work when I missed a connection to a train with mandatory bike reservations, but it was always resolved by train or platform staff. Edit: Of course, airline ticketing is also very complicated, but for air travel, most travellers are used to shopping around for the cheapest option, rather than turning up at the airport at 08:00 and buying a flexible fare to their destination. While this question is for UK, similar effects occur in continental European countries: low budget airlines appear very cheap, while regular rail service is way more expensive. Airlines have much lower maintenance costs for infrastructure. When it comes to building new lines, for rail it's almost impossible, has astronomical costs and takes decades for political and legal struggles, especially when eminent domain is needed. Also, many low budget airlines utilize formerly disused, military airfields from the cold war era, and airports in remote regions. Sometimes with deceptive advertising, which names an airport, 80 kilometers away, or 1 hour to drive, after a major city. Aircraft fuel has a much lower tax, or no tax at all on it, compared to other goods, and especially fuels for motorized vehicles. In some cases, remote airfields receive heavy subsidies, pushing their charges to airlines below the actual costs. And while many railway companies, especially where privatization hasn't gone as far as in UK, have to pay wages negotiated with unions, budget airlines can undercut them. Looks good for passengers first, but comes back to them in the long term. As transportation companies make really cheap offers under certain conditions, they must increase prices for regular tickets. This happens especially, where railway companies come under pressure by bus lines and budget airlines. The cheap offers are often planned ahead, with a fixed binding to a certain ride, while the expensive ticket can be purchased in the last moment, and be used in any train. Not to forget: Budget airlines try everything to make passengers pay more afterwards. Monstrous extra charges if bags are overweight, a 70€ "penalty" if a bank card payment fails, try to foist useless insurances during booking, make people pay even for payment, except when they take a very special credit card sold by the airline. Cheap airlines aren't really cheap; it takes a lot of struggle to actually complete a trip with a 10 or 20€ flight. The context of this answer is withon the UK. However, in your sample city-pair, flight already exists between them, and you are effectively asking "why can't trains keep up?" The answer is not everything serves everywhere well, however it is much easier for trains to add a stop, so they do better most places. Just this city-pair is a bit of a "ringer". Part of the cost here is in the circuitous rail route needed here. Keep in mind rail was built to pre-existing British cities, then additional cities popped up around the rail. So rail has an advantage most of the time. Versus airline, a hot mess of seat changes and required tasks, all short segments, none longer than an hour. Look at all the buzz. Always active, always doing something, another task you're obliged to do to keep your journey moving, it's hours and hours of "hurry up and wait". Now maybe you are happy for the task list, if so, there's your choice. But obviously a lot of people think different, because the train is able to command those prices. It's free market, on a 400 seat train, prices are set by the 400th highest bidder. Found manually on nationalrail.co.uk , which is quite good if you know where you want to change. Slightly cheaper than the £100.40 fare found by Gerrit and with 4 (direct) tickets instead of 5 so presumably one less change. I’d say it could be connected to freight carried by air, which enables the airline to offer lower passenger prices. About 15 years ago I regularly flew with Jet2 between Edinburgh - Manchester for around £30 each way (cheaper than a tank of petrol!). Sometimes the outbound flight on a Sunday was only 20-30% occupied, and I used to wonder how they managed to maintain the route. I found out when Jet2 cancelled it - the freight contract had ended. Train travel in the UK is indeed dearer, over longer distances, than flying. Flying is likely to be as cheap as any mode of travel, but long-distance coach travel is often a very good bargain indeed. It's not clear whether your journey starts in Manchester or whether you're flying into Manchester Airport. If your journey starts in Manchester, check out the cost of coach travel. If you're flying in to Manchester Airport, then you're probably better flying -- if you can find your way through Manchester Airport which can be ridiculously difficult. In a free market like in the UK, prices are generally governed by demand and supply and customers Willingness To Pay (WTP). Pricing and Analytics is big business with advanced data crunching and thousands of variables. It’s as simple as that. So far as consumers are willing to pay a certain price there is little motivation to reduce it. If and when customers are unwilling to pay the price, the price will drop to the point where they are willing to pay for the goods or service. At that point if the price is such that the company’s costs are exceeding its income, the company either go bust or finds cost cutting measures and efficiencies or sometimes subsidized by government. Bottom line the prices are high because customers still purchase. Although they both transport people, airlines and trains are not perfect competitors. Each has peculiarities that appeal to a segment of the consumer base at a particular price point. Not the answer you're looking for? Browse other questions tagged air-travel uk trains tickets or ask your own question. Recommendations on Car Hire and Train Travel for a UK trip in March 2013? Market economy: Why air is cheaper than train? UK train, ticket price for a single journey is the same price as a return ticket? Finding **cheapest** fares from a country to country/city/airport (including non-guaranteed connections)? Is my domestic train component of a Rail&Sail ticket valid if I ignore the ferry? UK Off-Peak Day return ticket with restriction forcing use of specific trains? Can I buy Shinkansen tickets that allow onward travel on JR regional trains?